Damp, relaxed fibers will stretch slowly back into place after shrinking. When washed improperly, knitwear made from natural fibers like wool or cotton tighten, shrinking the weave and leaving you with a less-than-ideal fit. Luckily for the laundry-challenged among us, natural fiber sweaters are highly malleable when wet. Take a tip from sweater knitters and wet block the sweater to reset the stitch pattern and the size. Fill the sink with warm water and add 2 tablespoons of baby shampoo to help soften the fibers. Soak the sweater in the sink for 15 minutes. Do not swish or scrub the sweater. Remove the wet sweater from the water and lay it on a clean dry towel. Roll the sweater in the towel to take out the excess moisture. A damp, not dripping, sweater is ideal for blocking. Lay out a large piece of corkboard or a blocking board on a table or counter. Place the sweater atop the corkboard and smooth out all wrinkles with the palm of your hand. Pin the outside edges of the sweater to the board with push pins. Run the palm of your hand over the sweater, from the center to the outer edges, to stretch the fibers. Apply gentle pressure and move the push pins as the knit stretches. Leave the sweater on the board for an hour, then stretch it again, moving the push pins farther outward. Repeat the stretching every few hours as necessary, until the sweater is completely dry and returned to its original size. 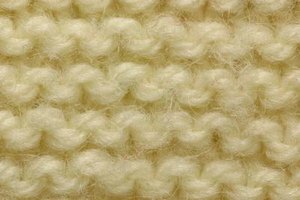 Avoid overstretching ribbed knits, as they will lose their elasticity.